This post has a series of DSLR tests using the Asahi-Kogaku Takumar 58 mm f/2.4 lens that came with my Asahiflex IIa which I wrote about yesterday (link). I compare it to a Super Multi Coated Takumar 55 mm f/1.8 lens and a Helios-44-2 58 mm f/2.0 lens. 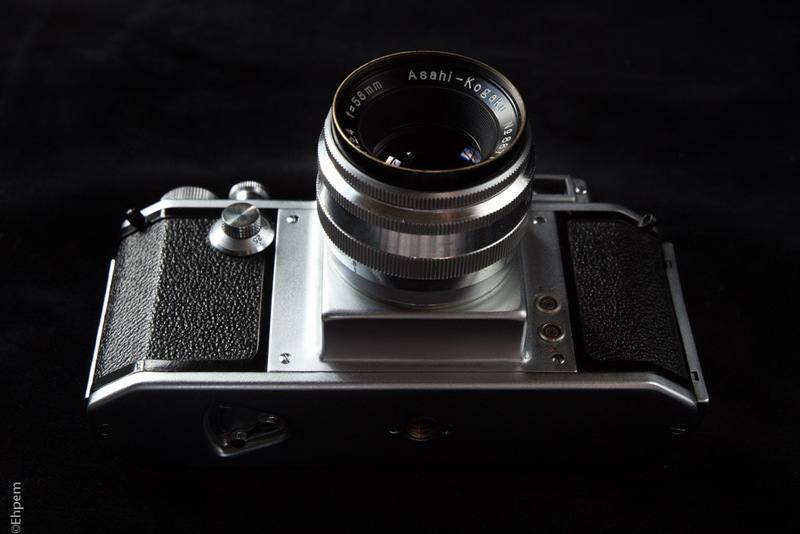 The Asahiflex lens has an m37 mount, the others have m42 mounts. The Super Multi Coated Takumar and Helios lenses are the ones that I own with similar focal lengths to the Asahiflex lens and both are quite well known among the vintage lens fraternity so provide useful baselines for comparison. After scheduling yesterday’s post for publication the m37>m42 adapter arrived and I have been able to start testing the lenses using a full frame Canon DSLR (5Dii). The m37>m42 adapter fits in the m42>EOS adapter just fine, and the flange on that adapter prevents light leaks that are found with some other DSLR adapters. However, with this adapter combination the lens focuses beyond infinity so one has to be careful not to get everything out of focus. Also, when mounted the inscription on the lens showing aperture, focal distance and depth of field is on the underside of the camera, which is very awkward. Click on any image below to see it enlarged, and navigate in the gallery with the arrows. Lens hoods for 135/3.5 (L) and 58/2.4 (R). The 58/2.4 was mounted on the Asahiflex when I got it and has no case or end caps. It does have an original lens hood in a leather case. In the gallery above the lens hoods and cases for the 58/2.4 and 135/3.5 are shown. The hoods separate in the middle so that filters can be inserted in them. When I took the lens photos I forgot to take one of the front of the lens, sorry about that. To test the lens I mounted the camera on a tripod and used full magnification in live view to focus. In the pictures below the focus was on the child’s toy centered on a washer that is on the steering post beneath a nut which is below the white cowling. I used a 2 second delay to steady vibrations, the camera was set to 100 ISO and aperture priority as the light was fading quickly. All shots were RAW with a Neutral setting so no in-camera settings influence the images. No filters or lens hoods were used on the lenses. Three pictures were taken with each lens – at f/16, f/5.6 and f/2.4. Some f-stops are near approximations where the lenses are not marked for f2.4 (on the Heliar it is easy to estimate, on the 55/1.8 less so); I could not see the bottom of the 58/2.4 lens clearly enough to be sure it was exactly on f/5.6. The f/16 exposures range from 1/5th to 1 second. The f/5.6 exposures were from 1/50 to 1/13. The f/2.4 exposures were from 1/100 to 1/60. The exposures were not all even in appearance, probably due to one of the m42>EOS chip adapters not having a programmed focal length which can confuse the camera. Therefore, the only change that I made to some of these images was to adjust the exposure in Lightroom to give them all a similar appearance (as judged by eye) at the centre of the image. The 55/1.8 images for f/5.6 were adjusted by -0.10 EV. The 58/2.4 images at f/5.6 were adjusted by +0.59; at f/16 by -0.52. Otherwise there are no sharpening, clarity, or other changes made except to crop details. The original images are 5616 x 3744, all the crops to show image detail were at 1501 x 1001 and are placed in precisely the same parts of the frame – differences in view are due to focal length differences and possibly tiny adjustments of the camera on the tripod during lens changes. The Super Multi Coated Takumar has a very good reputation, and the Helios has a reputation (and appreciation by many) for the nature of its optical defects and especially the out of focus areas. These tests make it obvious that the Takumar is a sharper lens than the Helios, but that is a widely established conclusion. However, these results also make it clear that the Asahi-Kogaku 58/2.4 is superior in sharpness to both of these lenses at all f-stops used. It is a bit soft in the corners at f/2.4, but still sharper than the other two lenses, and this pattern holds for the corners and centre of the image at all f-stops, though the Super Multi Coated Takumar 55/1.8 is nearly as good at f/16. Not bad for a 60 year old lens. The Takumar 55/1.8 has superior coatings so would likely perform better in high contrast light, and facing towards the sun, but I have not tested that since that was not the kind of light available (and rarely is at this time of the year around here). In the next few days I will conduct and publish similar tests for the Asahi-Kogaku Tele-Takumar 135/3.5 (here) and the Fujitar P.C 35/2.5 (here) that are included in my kit. Eventually I will also test this lens with the Bellowscope and extension tubes. And when the Asahiflex body is back from being serviced, I will make tests with all the lenses on film. Each group below is organised by full frame image then cropped details from lower left corner, center left and upper right corner. Please note that SMC in the captions does not mean it is the SMC Takumar version, it is just to keep the caption shorter. 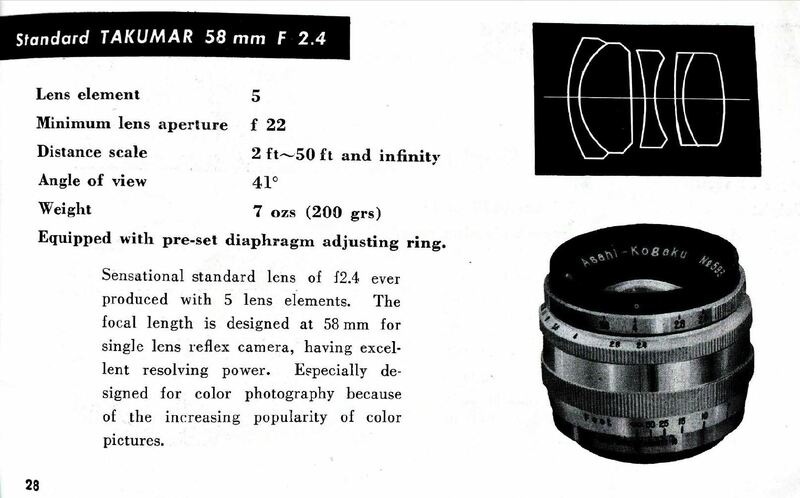 This was the Super Multi Coated Takumar version of the 55/1.8 lens. Click on any image below for larger view and navigate with the arrows.